After four years at the Civil Justice Institute, Emily Kelchen, our Director of Public Affairs, is leaving us to pursue other opportunities. We wish her the best in her future endeavors! Should attorneys get paid for work they didn’t do? If so, should that money come out of the pockets of injured workers? Those are the questions policy makers who voted yes on S2145 need to be able to answer. April 5 was a busy day under the State House dome. 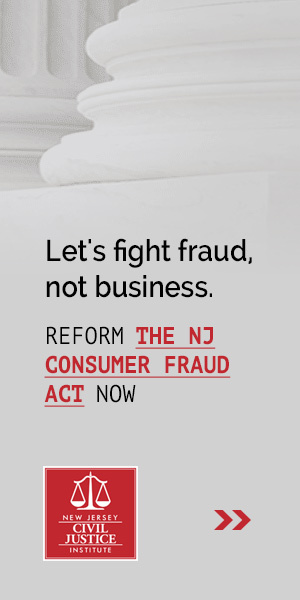 While the halls were swarmed with people up in arms over vaccines and nuclear power, two other bills attracted the attention of NJCJI and our allies in the business community. Several employment bills will be heading for floor votes on Monday, including two of particular concern to NJCJI. The “Diane B. Allen Equal Pay Act” continues to regulate much more than “equal” pay and would present a significant danger to employers who do, in fact, compensate all employees equally for equal work. S121/A1242, legislation “Concerning Discrimination” would also impose significant risk on employers, attempting to interfere with the enforceability of widespread employment contract provisions and run afoul of the Federal Arbitration Act. A selection of the need-to-know civil justice news for March 10-16. Governor Phil Murphy campaigned on a promise to sign sick leave legislation. He mentioned the issue again in his budget address, urging the legislature to get a bill to his desk. And an Assembly version sponsored by Assemblywoman Lampitt was heard and voted out of the Assembly Labor Committee this week and is moving through the legislative process. On March 13, Gov. Murphy delivered first budget address to a joint session of the legislature, giving the state its first good idea of his priorities now that he is in office. From now until July 1, the legislature will be focused on passing a budget built on the foundation Murphy laid. A selection of the need-to-know civil justice news for March 3-9.